Today on the podcast we have Manny Torres. You may remember him from American Idol a few years ago. He made it to the top 14! I met through a common friend and I’ve enjoyed hearing him perform live in downtown Chicago. I asked him to be a part of the podcast today to share his story. I know you will be inspired by his faith as he went from a lots of success and a total high to a low point in his life because of a difficult diagnosis. ​Manny Torres is a Chicago based singer-songwriter that lives for the passion filled experience of his live shows! His music brings the secular and the sacred into conversation with each other, as he writes and covers songs that demonstrate the beauty, pain, and hope that comprise the human experience as a whole. His voice is warm; even as he sings about heartbreak, such as in “Real Lies,” his ineffable joy resides underneath his sorrow. 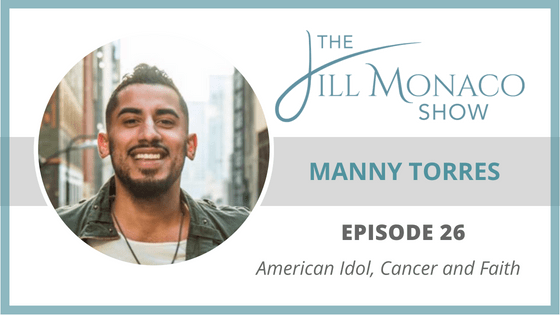 The effect of this is that Manny enables his listeners to bring their own hurting hearts into song with his—he creates space for them to fully feel their pain, release it, and partake in the musical healing offered by his voice. In this way, Manny’s music is an invitation to his listeners to embrace their hopes and fears, their joys and sadnesses and find peace and calm within the messiness of life. How Manny radically shrunk his cancer by over 50% in a month (before treatment)! Manny’s audition and the last golden ticket!